But, it would probably bother me on some level, right? As a Spider-Man fan, I want to see a Spider-Man movie. It would be almost insulting for a studio to take the name and apply it to something so radically…un-Spider-Man-like (that word has way too many hyphens). 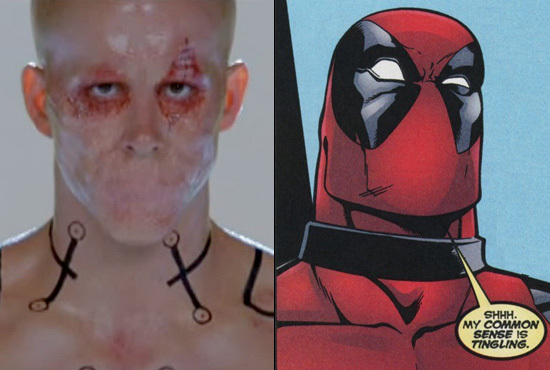 And before you argue that an adaptation that loose could never happen, I will redirect you to this image of Deadpool from that bad Wolverine movie from a few years ago. Or Darren Aronofsky’s Batman script that almost entered production. To be fair, I’ve always wondered to some extent why studios don’t just declare such radical departures new works entirely. I mean, if that Aronofsky movie came out today without Batman in the title, I’m not sure the average person would connect those dots. And while adding the Batman name to it would help it sell, if it’s actually a legitimately good idea that you have that much faith in, why not pitch it independent of the Batman name and make an actual Batman movie concurrently. It’s, like, double money! Or something. I’m not positive how Hollywood accounting works. Anyway, if I regard each work as independent of the source, then what exactly do I look for in an adaptation? Ultimately, the best explanation I could come up with is recognizability, preferably of the main character. Every iteration of, say, Spider-Man doesn’t need to have everything that the original of Spider-Man had. If one version wants to downplay his high school years, or focus on his relation with his absent parents, really, as long as they do it well and justify it in-story, I’m fine. However, there has to be enough there that I can’t recognize that it is Peter Parker and his universe/cast in some way, regardless of whether its set in colonial America, a noir-influenced 1930s, or a universe of anthropomorphic animals. One way I’ve seen this concept presented is Broad Strokes. But if an adaptation fails on that most basic level? I still don’t think I would call it bad if I don’t think it deserves it. Another way I think about this is in considering Disney films. I’m a big fan of the Disney Animated Canon, but let’s be honest: few, if any, of their movies are loyal adaptations of the source material. That doesn’t stop me from enjoying a musical of Hercules with a Motown-inspired soundtrack. It makes me wonder sometimes why they just don’t market films as original stories when they share absolutely no similarities with the original (see Frozen and "The Snow Queen", for one example). But it doesn’t make me enjoy the films any less. That meandered all over the place, but I feel like I’ve finally come to a place in my reasoning that I feel is logically consistent, and that’s all I can ask for. So tying it back in to last time: for as much flak as Iron Man 3 gets for changing the Iron Man canon, I think it made sense in-universe while being enjoyable and remaining recognizable, which is all I can ask for when adapting comics (or anything) into a film.